The Marina Square project of BIM Group is becoming a focal point in the real estate market as it embarks on a new trend of “boutique hotel with shophouse (BHS)”. The new real estate model offers outstanding advantages and is a smart investment channel for real estate investors. What is “hot” about the BHS model? The trend of BHS started during the 1990s in major cities such as Paris, London, New York and San Francisco. Today, it has become one of the favourite types of accommodation. This model has only been popular in Việt Nam in recent years and yet it has attracted a large number of investors. BHS is usually an independently developed property or chain of hotels. This model perfectly fulfils the criteria of a modern travel experience at reasonable prices, while bringing about profits as the architectural design combines both commercial townhouses and rentals for vacation. In Việt Nam, this model has attracted the “big giants”, including BIM Group and Sun Group. 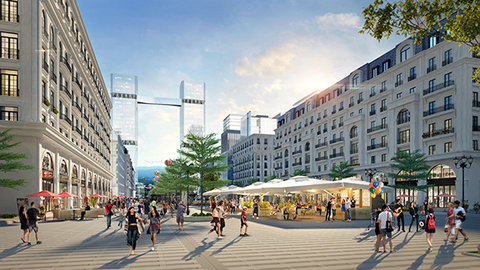 Marina Square promises to become the new central pedestrian street of Hạ Long City. What is special about Marina Square? Following the success of the Phu Quoc Waterfront project, BIM Group has continued to invest in the Marina Square project in the modern urban area of ​​Halong Marina. This is expected to be a second “Phu Quoc Waterfront”, a resort property project that is in high demand in the hotel business. With a limited 88 units available for sale, owning a property in Marina Square is becoming more and more valuable. The decisive factor that makes Marina Square different from other projects is the position of a “dragon reaching out to the sea”, which is the bloodline connecting the Hùng Thắng mountain range to the shores of Hạ Long bay, symbolising prosperity, abundance and surplus value for investors. Moreover, the project is located in the heart of Hạ Long city in Quảng Ninh province, a heritage city home to the world’s natural wonder, Hạ Long Bay, which is potentially becoming the leading tourism centre in Southeast Asia to attract investors. Although Ha Long city is yet to have a well-invested pedestrian street despite attracting a huge number of tourists, Marina Square is now poised to become the “most magnificent” pedestrian street of the heritage city. The Marina Square project owns the most beautiful location in the entire metropolitan area. Marina Square is an important piece to complete the picture of Halong Marina, the largest and most modern urban area in Hạ Long city. It was approved by the People’s Committee of Quảng Ninh province to be developed into a service-holiday-resort centre. With the development orientation of Halong Marina, BIM Group is committed to converting Peninsula 2 into Quảng Ninh’s leading tourist centre. 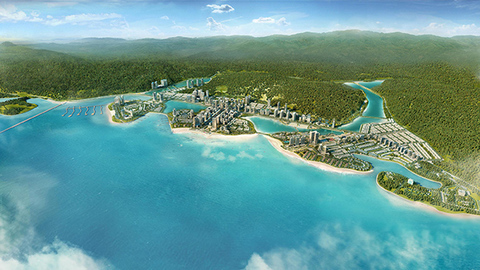 The entire Halong Marina project has been invested by BIM Group. Few people know that Marina Square is the brainchild of the world-renowned architect, Salvador Perez Arroyo, whose works are recognised and praised globally. In Việt Nam, he is known for “Quảng Ninh Museum”, which looks like a black pearl in the Gulf. 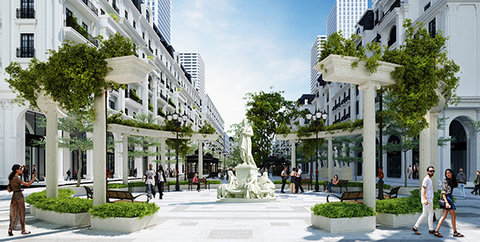 Arroyo has chosen a neoclassical colour for Marina Square, which is likened to the brilliant hub beside Hạ Long Bay. Marina Square does not fully utilise land funds to maximise profits for investors. The project is subdivided into small cosy hotels to maximise the benefits to customers. The project has an intelligent design, owning at least two facades, with the corner having three. The hotels are airy and have enough sunlight filtering in and they make full use of space to maximise the benefits for customers. The corridor on the first floor is suitable for opening shops and cafes to increase the value of investment for homeowners. Inside the house, which are handed over unfurnished, there is an estimated area for stairs and elevators. Homeowners can design, decorate and arrange the interiors according to their needs.